At the initial disability determination level of your application, your role in the disability process is a relatively simple one. Complete all claims forms accurately (whether it be a work history form, the Activity of Daily Living function report or the various other questionnaires sent to you for seizures, pain, cardiac problems or the like). Not providing all the information you are asked for can hurt your claim. Why? In many instances, it is as simple as the examiner not having (or making) the time to give you a follow up call to get the missing information. This site will pinpoint some of the crucial questions that you must answer and how to answer them correctly when completing SSA disability forms. Offer to assist in getting medical records if the examiner has not been able to get a response from your doctors/medical practitioners (called MER--medical evidence of record). How will you know that the examiner has not been able to get the information? See #4 below (and the article entitled Checking the Status of Your Disability Claim). If you do provide medical records when you apply for disability, I can show you how to keep that act -- which you consider helping -- from working against your processing time. Because it is the exception rather than the rule that medical records are received with a case record by the examiner, many examiners will put those claims aside for a period of time because it involves a little extra initial work. I can show you how to keep that from happening by simply adding one cover sheet listing a little information regarding the dates of treatment, etc. Keep any consultative examination (CE) appointments that you have been given with a doctor that the examiner asks you to attend, and be on time. Generally, if you are asked to attend a CE, it means that the examiner has not been able to "allow" or issue a favorable decision on your claim based on the medical information already in your case record. There are many reasons why failing to keep a CE appointment frustrates your examiner to no end. But the number one reason actually has nothing to do with you or even the reason you say you could not keep the exam. I will explain why keeping your CE appointment at all costs is critical to maintaining a positive relationship with your disability examiner. Periodically check the status of your disability claim . You can do this strategically to ensure a decision at the earliest possible date. At what point in the determination process should you make the first call, the second, the third? In addition to providing specific examples of how to complete forms in a way that provides the most useful information to your examiner, I will also explain how each of the forms are used in the sequential evaluation process. Sample forms for review will be available. For example, in completing the work history form, many claimants do not indicate the number of hours he/she "stoops" on a job or has to "stand" or "sit" on a job, or do not indicate the amount of "reaching" done on a job. Electing not to calculate or estimate the amount of time you spent doing a specific activity during your 8-hour workday can actually mean the difference between an allowance and a denial on your claim, especially if you fall in the age category of an "older" individual. Examiners should call you to get additional work history that address this information when you leave it off your work history form. But...you may never get the call if your examiner is managing a growing caseload of 150-200 claims. So where does the examiner get the information from if they don't call you to clarify? Good question and the answers will be revealed as this site is developed. 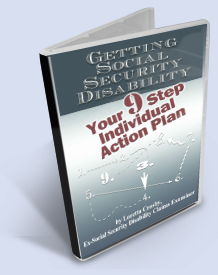 "How to file your application for Social Security Disability", an article by Jonathan Ginsberg, Attorney. Giving a complete work history is crucial in documenting your social security disability claim.Many claimants gloss over telling how long they had to sit, stand or bend in their previous work or fail to tell how much lifting they had to do. An incomplete work report can cost you your benefits.